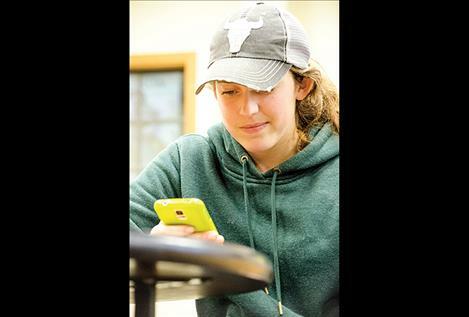 VALLEY CREEK – In the cold hours of a winter morning in mid-January, Kylee Wells, 17, put on a pair of snowshoes and went on a hike not knowing she was about to encounter a pack of wolves. She started out alone like she did many times on a trail not far from her home in Valley Creek, located on a turnoff about ten miles north of Arlee, and a few miles from a Lake County waste container site. She walked over snow more than a foot deep, carrying a daypack with a little lunch, a bottle of water, and her cellphone. She was moving at a pretty good pace, enjoying the snowy landscape accented with trees. About a mile and a half from where she started, she stopped near an open meadow. She heard a faint noise like a dog whimper in the distance, but her dogs were at home so it couldn’t be them. Maybe it was a coyote, she thought for a second. She looked up in the direction of the noise and saw something she never expected to see. A pack of gray colored wolves ran along the hillside in her direction. “There were five of them,” she said. The wolves were still coming when she made it to the tree. She looked up to see a sturdy branch not far from her head. She jumped up and grabbed it, but for a moment, she couldn’t get up the tree. She wasn’t a stranger to tree climbing, so she knew a few tricks to getting up the bark-covered trunk, but the snowshoes were holding her down. With a surge of adrenalin, she kept one arm hooked onto the tree and reached down with her other hand to unhook the snowshoes. They dropped to the ground and she pulled herself up onto the branch. Her hands were shaking so badly that she only climbed up a few feet and decided to stop before her nerves caused her to slip. She was surprised at how their legs looked long under thick winter coats. The hackles on their necks were up, but they weren’t growling. The wolves walked around and checked out where Kylee had stood before going off and bedding down in the timber not far from where she was sitting in the tree. Kylee got out her phone and called for help. Without hesitating, Tonja grabbed two guns, jumped on a 4-wheeler and drove as fast as she could to help her daughter. She drove as far as she could before getting stuck in the snow. She continued on foot toward her daughter but without any snowshoes, pushing through calf-high snow was difficult. “I just kept thinking about her,” Tonja said. Kylee was still sitting in the tree. She was too scared to think about taking pictures of the wolves when they first appeared, but with her cellphone out after calling her mom, she started video recording the open field in front of her. She captured an image of wolf tracks under the tree, and not far off, the sound of howling wolves can be heard. She stopped recording after a few minutes. She listened to the wolves howl on and off for about two hours while sitting up in the tree when another sound caught her attention. She listened for a moment and heard the sound crushing snow. She knew it was her mom. Kylee climbed down from the tree and ran to her. “She held onto me for a long time,” Tonja said. The two walked back down the trail toward home, watching and listening for any sign of the wolves. The family has a cattle ranch up Valley Creek and they also run cows on rented pasture higher up in timber areas and mountain pastures. They’ve seen wolf tracks for years and even had a few cows and llamas go missing, but prior to this, they’d never actually seen wolves. Kylee has however seen many grizzly bears in the area and other wild animals. “I have a respect for wild animals, and when I see them, I let them go their way and I go my way,” she said. She added that seeing wild animals is part of what makes nature enjoyable. She said that though being treed by wolves was a scary experience, she still plans to go hiking as being in nature is one of her favorite activities. She said wishes she would have been more prepared for the wolf encounter, and wants people to be aware that wolves are around. Confederated Salish and Kootenai Tribe’s Wildlife Management Program Manager Dale Becker said gray wolves have been documented in the area where Kylee was for about 20 years. He said reports of wolves killing or injuring humans are rare. He said there was an incident in Alaska a few years ago where wolves had been habituated to humans with food scraps, but usually they are timid around people and sometimes a little curious. Becker said people are also permitted to kill a wolf on the Flathead Indian Reservation if it is actively threatening a human life or attempting to kill domestic animals or livestock. If people or animals are not in immediate danger, the problem needs to be reported to Tribal Fish and Game so that they can handle it. If a wolf is killed, the agency also needs to be notified. The CSKT Wildlife Management Program developed a Northern Gray Wolf Management Plan for the Flathead Indian Reservation in 2015. The report is updated every five years. 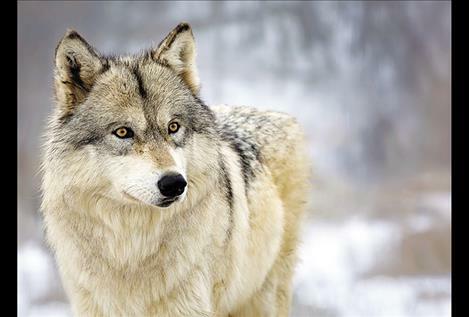 The tribe recognizes the Gray Wolf as a native wildlife species, and at this time, hunting or trapping wolves is not allowed on the reservation, according to the report. Wolves in Montana and other Rocky Mountain states were thought to be eliminated in the 1930s due to state and federal sanctioned wolf elimination programs. Wolves started to naturally emigrate from Canada into Montana and Idaho in the 1970s. The states worked to further strengthen the recovery with a reintroduction program in 1995 at Yellowstone National Park and northeastern Idaho. In 2008, an estimated 1,695 wolves with 95 breeding pairs were in Montana, Idaho and Wyoming with 39 breeding pairs in Montana alone, according to the report. Montana had a minimum of 627 wolves by the end of 2014. On the Flathead Indian Reservation in 2014, Tribal Wildlife Biologists observed wolf activity in seven locations on the reservation with a minimum of approximately 30 wolves. Recovery efforts resulted in wolves being removed from the Endangered Species List in 2009. Wildlife management agencies assembled management plans to guide the future of the species. The tribe’s management plan includes measures to maintain the long-term presence of wolves on the reservation while minimizing conflicts between humans and wolves. The tribe has worked to consider the contrasting viewpoints about wolf management on the reservation, according to the report. Many Native Americans view the wolf as the return of a brother to the landscape. Environmentalists see it as the return of a missing piece of the ecological puzzle. Many stock growers are concerned about wolves preying on livestock, and big game hunters expressed concerns about the short and long-term impacts of wolves on game populations. The gray wolf is the largest native canid species, weighing in around 60 to 130 pounds, measuring 4.5 to 6-feet in length, and 26 to 36 inches tall. They vary in color from gray to black and occasionally white with an average of six individuals in a pack. They have long legs, large feet and straight tails. Their tracks generally measure just over three to five inches long and two to five inches wide.